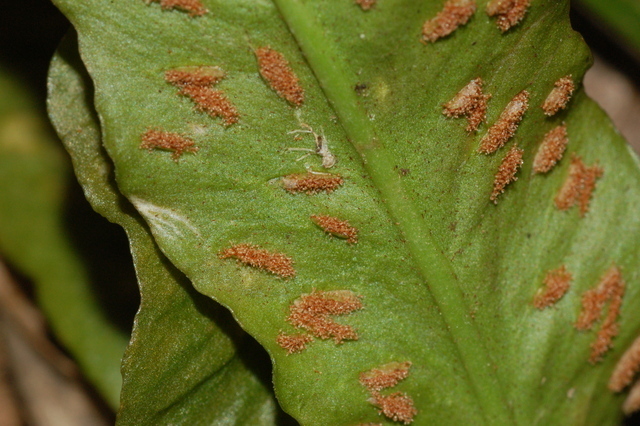 Asplenium rhizophyllum.John Hilty.www.illinoiswildflowers.info (Accessed 5/2014). Asplenium rhizophyllum is a perennial, evergreen fern, from a short, erect rhizome, 0.2 cm diameter. Leaves in rosettes at end of rhizome, stalk 0.5-12 cm long, green, base brown, scaly, blade undivided, 5-30 cm long, 0.5-5 cm wide at base, very narrowly triangular with an elongate tip that often roots and grows new rosettes at its end (thus “walking”), base lobed, occasionally narrowed and rooting (Radford et al. 1968). 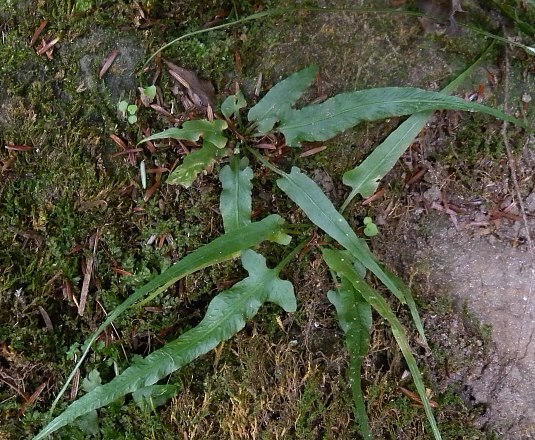 Asplenium rhizophyllum, Walking fern,. spore cases. © John Pickering, 2004-2017 · 1. I_JP33773. dicoverlife.org (Accessed 4/2017). Spore cases linear, length variable, scattered along veins on leaf underside. Frequency in NYC: One plant found in the cliff-like stone work of the Metro North trestle. Habitat: Normally grows on mossy limestone rocks, in cool, moist, shady forest understories, occasionally on acidic rocks such as sandstone (Flora of North America 1993+).